Governing in a Global World captures the panorama of women governing around the world. Even though the modern era marks history's greatest advancements for women, worldwide they hold fewer than 30 percent of decision-making positions and are often missing from negotiating tables where policies are made and conflicts resolved. 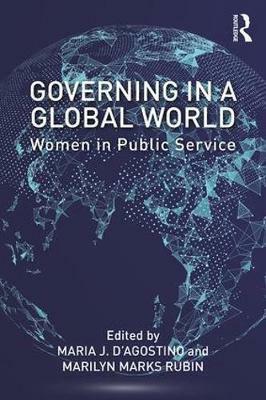 The opening chapters present trends and context for studying women in public service by focusing on path-setters across the globe, the status of women in the world's executive and legislative bodies, and their participation in public service across several nations. Later chapters examine power, leadership and representation of women in public service, with several chapters looking at women governing from a regional perspective in the Middle East, Sub Sahara Africa, Latin America, and China. The final chapter presents empirical evidence that shows how policies to increase women's representation in the public arena reduce gender inequality more than any other policy intervention. Taken together, the chapters illustrate the worldwide importance of, and challenges to, promoting gender equality and women governing. 15. Gender Equity Worldwide: Where We Are and Where to From Here? Maria J. D'Agostino is Chair and Associate Professor in the Department of Public Management at John Jay College of Criminal Justice. She is also a member of the UNDP roster of experts in Gender Equality and Women's Empowerment in Public Administration and co-founder of Women in the Public Sector at John Jay College. She is the guest editor of the Women and Public Administration Symposium recently published in Administration & Society and is a recipient of the Faculty Mid-Career Research Award. Marilyn Marks Rubin is a professor at John Jay College of the City University of New York and is Director of the College's MPA Program. She has been a consultant on fiscal policy, economic development and strategic planning for US municipal, state and federal entities and has authored several publications on fiscal policy and budget-related issues. Rubin is a Fellow in the National Academy of Public Administration (NAPA).